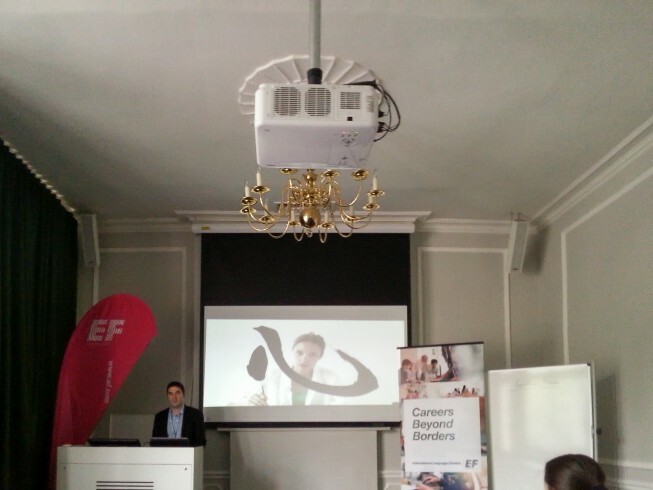 I’d been in London at the EF School at Russel Square in September 2014.1 That was the (natural) consequence of my efforts to improve my skills in English speaking and writing. The special reason why I travelled to London was that there was a frame programme called „Careers beyond borders„. I decided to book an intensive course for one week exactly at that week. With the different presentations and due to several workshops of the programme it was possible for me to learn something specific, for example writing a CV in English. I also learned thereby the topic „elevator pitch“. I hope that I applied it successfully to my own homepage. Before my journey to London I prepared myself via EnglishTown, the virtual Learning Platform of EF. In this blog I’m going to compare the two ways of learning English because I think that both have their different advantages. Furthermore I think that these advantages could be combined. At least I would assume that both should work together very fine. But in reality there are some difficulties. But first of all let’s go ahead with the comparison. EF School at London Russel Square. The picture shows the large conference room, with its nice furniture, in which the most sessions of the frame programme „Careers beyond borders“ took place. On the lectern speaking is David Pires, Digital Marketing Manager of EF. He encouraged me to write this blog. Photo: Alexander Klier. Published with friendly permission. the necessary and evaluated writing challenge after to finish and pass a unit. After each lesson in class and writing about the topic of the unit I got a detailed feedback from the teachers. Additionally I have the great advantage of four private lessons each month with my subscription plan. The private lessons also include detailed feedback and helpful support from the teachers. By learning and practicing on the EnglishTown platform I eventually decided to join a course of EF in London at the campus Russel Square. I think it also has been the right decision at this stage of my learning progress. It had been a great experience for me – and really an intensive course. Normally, I was very exhausted in the evening and couldn’t do other things than driving back to my accommodation and rest.4 During the course, we, that means the students, spoke the entire day in different contexts about various topics. This course construction worked well. Nevertheless, it was possible for me to get an individualized time table. The schedule was in such a way individualized that it also included some lessons of the frame programmewich was the very reason for me to join the programme in the first place. Last but not the least I want to mention that all teachers have been excellent. After one week I had developed the ability to speak in many cases fluently in the context of the course. The timetable included lessons, or better the possibility to learn via the iLab too. That means it was possible for me to learn in a familiar learning environment because the iLab is based on the same platform as EnglishTown. So both courses have something in common despite their completely different „philosophy“. happened in both courses. Or better during my trial to combine both advantages. The third thing worth to mention is that you should be aware that EnglishTown as a platform needs an adequate technical equipment. The precondition normally include a sufficient bandwidth of the internet connection. Even in the case you have the right equipment you should bear in mind that it is sometimes impossible to hear the other students in the class. This is a real advantage of face-to-face courses. Over all I have do admit that both kinds of learning environments are working well. For me the better way is still learning via EnglishTown. But the changing to one week intensive speaking in London at this stage of learning progress was very helpful for me. For the future, I wish that the two different possibilities will be blended. That’s what I’m experiencing in my profession as well: That the blended-learning environment works best when it is a real blended-learning construction.